There are many boxing gloves on the market and only some of these can be used for all training types. And only some of these pairs have decent quality. In my boxing training sessions, I tend to use training type gloves and I can easily say that I have many experiences for choosing it. Below there are best boxing gloves for training, the sizing chart and also you can find my experiences as well. Note: All boxing gloves below can be used for all training types including focus mitt, punching bag, double end bag and sparring. I am sure that you have seen Winning in many best lists and you will continue seeing it. Because there are many reasons for it. This pair is referred as pillow because the padding is a lot and will protect your knuckles, also sparring partner. With that it also changes place quickly. It means that after you punch the padding will return the original place without losing any time. In that way Winning makes sure that your hands remain safe and also thanks to that the padding’s durability extends a lot. You can expect to use it 3+ years and it won’t have any rough or soft spots. It also provides very good quality wrist support and that is just a must for heavy bag training. Our knuckles face most of the impact however our wrists also face it. And sometimes you may not punch with a proper form and even then your wrist remain relatively safe. I also used this pair and all I can say is that it is the most quality pair of boxing gloves which I have ever used and many actual buyers also say the same thing. You can also read my extensive Winning Boxing Gloves Review for more details. Price: Alright the price is 2 times of quality boxing gloves. However Winning is not a quality pair, it is a premium pair. And you can use Winning Velcro 2 times more than any pair. Considering the incredible training performance, I can easily say that its price is justified and I rarely say that especially for expensive products. You can get it according to sizing chart below. Important Note: All pairs on this are training type pairs and you can choose it according to size chart above. Cleto Reyes is widely used in matches and I am sure that many of you saw that Manny Pacquiao wear Cleto Reyes. However he does not only wear for matches, he also uses training model of Cleto Reyes for practice as well. Cleto Reyes Training Gloves are made of genuine goat leather and it is really comfy. With that when you do sparring with it, this pair won’t cause any cuts whatsoever. This genuine leather is actually not hard and won’t have any defects any time soon. Price: When you consider the genuine leather and the training performance Cleto Reyes is top notch. With that the price is actually quite good. Because boxing gloves, which are in the same price range, don’t provide long durability period as Cleto Reyes do. On top of that Cleto provides very good training performance. Check out amazon for the latest price of this amazing pair. It has also many color selections including red, green and purple. Boxing gloves, which are made in Thailand, have something in common. Based on my experiences these always have very good thermal regulation so your hands can stay fresh as much as possible. Twins Special also has it. It is made of genuine leather and based on feedback from several boxing forums, it has some serious quality as well. This also explains why it gets very good ratings from everywhere. Because it is just durable and all around pair. And basically it provides good training performance and safety as well. As a side note this pair is more padded at the upper side. This provides shock to distribute more. If you complain about sore hands after your training session, Twins Special can be a really solid choice for you. This pair also can be used for all training types and I really heard a lot of good things about this pair. It will be probably my next boxing gloves as well. If you are interested, I already reviewed this pair in more detail on here. Price: Considering the price I can actually say that you get a pretty sweat deal. And keep in mind that it is made of genuine leather. Go on amazon for the price. You have a lot of color selections including pink, red and white. I will cut this short. I know it, you know it and everyone in the boxing community knows it. If you have the cash, go and buy Winning. It will last way longer than any pair and your hands will be safe. And most importantly it provides very good quality training sessions. If you are interested, check out the best boxing gloves for training on amazon. However if you don’t want to spend a lot of money then both Twins Special and Cleto Reyes won’t disappoint you. 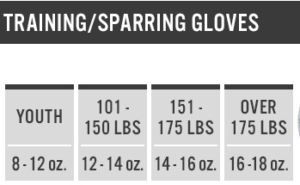 You can choose any of these gloves according to size chart at the beginning of this page. I really hope that you enjoyed reading and if you have any questions, experiences please just have a comment below. Excellent post!! Very informative, and I really enjoyed how you put the best information right out there, without any beating around the bush. I used to really enjoy Muay Thai, this makes me want to start going to the gym again. Thanks! I am glad you liked it man. You can hit the gym with any of these 😉 I only did boxing training types with them but I know many people who practice other martial arts also use these. Having been a boxer myself, when I was younger, I read your review with great interest, and I wish to thank for taking the time to maintain such a great website. Your selection of the best boxing gloves is really spot on. I will John, thank you. I think Cleto Reyes would be right fit for you. If I get a used pair, I don’t want to get Twins Special or other gloves which are made of synthetic leather. Cleto Reyes can last a long time and even though I don’t prefer using used gloves, people might probably buy it. I used to train boxing and MMA and I just bought the cheapest gloves I could find. Big mistake. I ended up with gloves that hurt my hands and didn’t have the durability that I needed. Great article, I wish I would have read it when I was still training! Thanks Furkan! Hi Kelly, cheapest gloves generally tend to that. That probably happened because of the padding quality. I am afraid there are just many boxing gloves which have bad padding quality. Well at least you now know what you should get 😉 You are welcome Kelly. Hi Furkan! I checked out the Amazon link you provided. They show the Winning Training Gloves with laces as well. Is one format better than the other? Great break down. Thanks. Hi Juan, your partner can tie laces for you. If you like it really tight then you should go with laces. But I prefer velcro. You can take it off very fast and you don’t need anyone. If you have someone to train with, you can go with laces otherwise I recommend you to get velcro. Personally, I seriously hate to ask someone to deal with laces of my gloves. Nice break-down of the boxing gloves. I never really thought about buying a pair of gloves but these gloves you listed look really cool. I’d love to do some sparring with those gloves. I think I can go 10 rounds. Which is the best pair or your favorite pair? Well, you have some stamina, Tom 😉 If you will also do sparring, you should definitely get the pillow which is Winning. I have a pair of everlast gloves but I may need an upgrade. I use to be more into mma, but having good hands is part of the equation. Thanks for the information as I now know a top quality glove to get in the future. Man, Even, some Everlast pairs can cause serious injuries in your wrist or hand. You should definitely upgrade Everlast and after training with either one of these, you will feel like you have not used proper boxing gloves before. Twins Special has a lot of padding and surely it can protect your hands 😉 You can get it according to sizing information which I provided in the writing. Wow! Three years is a long time to be able to use a piece of sporting equipment. Is this taking into account a regular practice of sparring every day or is this for someone who only averages working out once a week? I’m sure it will differ from person to person. With the cost at two times that of a regular pair, I’m happy to hear that they last so long. It sounds like these are real quality boxing gloves. Yeah, you can use them for sparring, pad work or any other training type. And having a couple of sessions per week is what you supposed to do. Also, training type gloves last longer since these are built to take constant punishment during different workout types. So the price actually becomes better since if you get a glove for one training type (bag work etc. ), it actually costs more.